One archbishop and twenty priests are alleged to be the only people remaining in the northern Iraqi town of Qaraqosh. Two days ago, fighting broke out between Kurdish peshmerga and ISIS fighters in this Christian town of 50,000. All inhabitants of the town are reported to have fled. 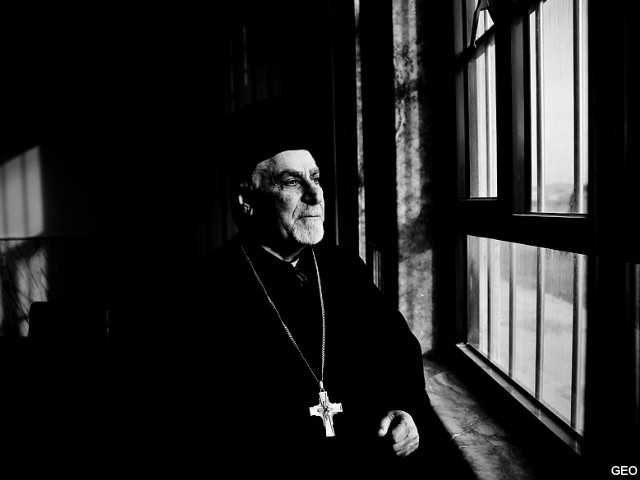 The Syrian Catholic Archbishop of Mosul, Yohanna Petros Mouche (pictured), has been working to negotiate between the Kurds and the Sunni ISIS fighters. But according to Bishop Yousif Habash of the Syriac Catholic Church in Union City, New Jersey, who spoke with the Archbishop earlier today, all efforts at negotiation have been rebuffed. Archbishop Mouche was told by ISIS there is only one solution, and that is that the Peshmerga must leave. The Archbishop has stayed in the town with twenty priests. The Assyrian International News Agency reports that ISIS issued an ultimatum to the Kurdish forces that they must leave by 7:00 p.m. or face an attack. Archbishop Mouche told Bishop Habash by phone that the only thing that can save them now is help from the Americans.